✅ Comfortablly Holds Passport, Tickets, Bills, Cards, Id's, Etc. ✅ A Thoughtful & Functional Gift for your Family or Friends. a) Unlike ours, most of the leather products in market are “NOT” 100% Genuine Leather but different Varieties of Synthetic Leather like PU or Faux Leather? b) Unlike us, in order to bring sturdiness and variety in designs leather fibres are mixed with other fibres? These products have advere effect on environment. These products more easily torn or punctured. These products do not develop the same luster and patina over time as leather. These products are hpyer-allergenic i.e. relatively likely to cause an allergic reaction. a) Always made with lustrous, soulfully tanned, ageless — Genuine Leather ? b) Have straight forward utility based design that respects urban sensibilities ? 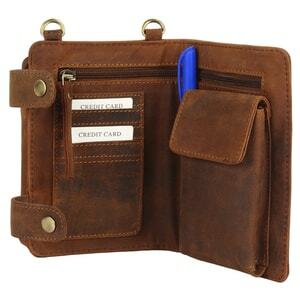 Made from 100% Genuine Durable Buffalo Leather, Quality Tested. 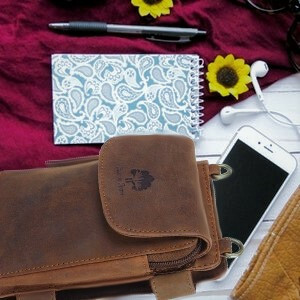 Product size of 4.3 x 2 x 6.7 inches; makes it easy to carry this handy pouch anywhere. Incredibly light weight, weighs less than an ounce. It can Hold Mobile, Credit Cards, Id's, Passport, Tickets, dollar bills, Etc. 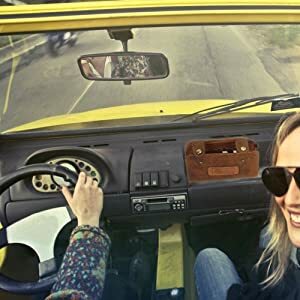 The handmade leather zippred crossbody wallet is spacious enough to fit your wallet-coins, and other essential accessories with advanced features. 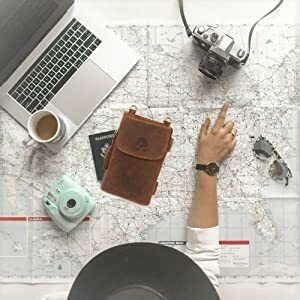 The amazing design makes it a great, eye-catching traveller gift for friends and family, especially for those who love leather. Durable construction with strong thread stitched, that will last for years. 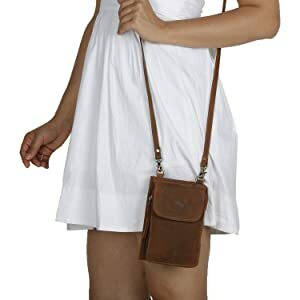 This leather zippered crossbody wallet pouch, so that you can easily access your wallet, Credit Cards, Id's, Passport, Tickets, Etc. Quick Access Outside Strong YKK Zipped Mobile, Passport Pocket. 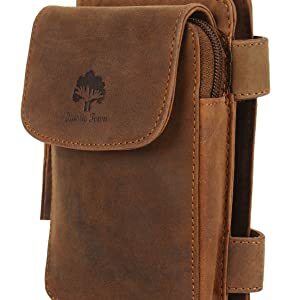 The engaged separators between each inner section in your genuine leather zippered crossbody wallet pouch will help to keep your cards and valuables free from scratches and damage while ensuring that you can grab the items you need at a moment's notice - perfect for this airport hassles or during airline travel. Due to the handmade process this bag develop patterns with time making it one of a kind! One Main Zippered Pocket for your Mobile, Passports. Also includes extra soft inside accessories features to improve and care for your extra. Give family and friends the gift of fear free during going anywhere.